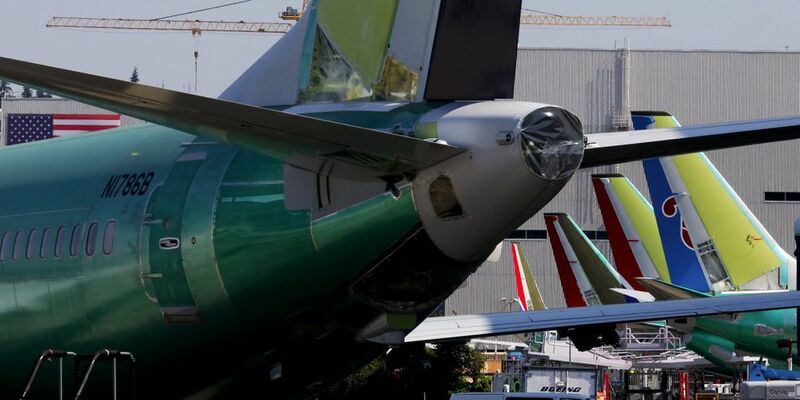 As 737 jets continue to pile up at Boeing's assembly plant in Renton, employees are working long overtime and struggling to get planes finished. Management has assured Wall Street that it can fix the production issues by year end. Some of Boeing's frontline workers are skeptical. 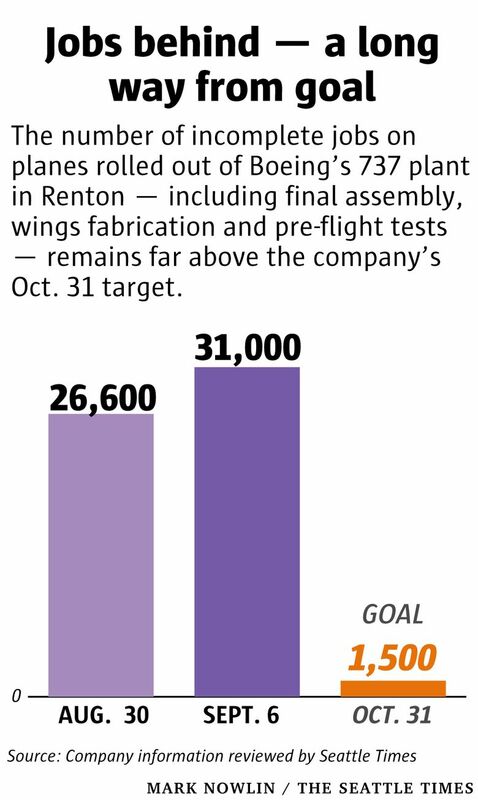 As 53 undelivered jetliners sat parked outside Boeing’s Renton plant this week, up from just over 40 a month ago, workers inside the factory were feeling the pressure of constant overtime and an unrelenting build-up of unfinished tasks. Though Boeing assured Wall Street analysts visiting Seattle Wednesday that the pile-up of 737 jets has peaked and will be sorted out by year end, some frontline workers were less optimistic. Planes awaiting delivery filled the ramps along the edges of Renton Municipal Airport on Tuesday, spilled onto one of the taxiways, and were parked on all available spaces on the Boeing site, along the lakefront and between the buildings. Of those, 38 were the new 737 MAX model, 14 of them missing their engines. Delays in delivering the MAX model’s new LEAP engines, made by CFM International, are just one of the choke points causing the pile-up. Two workers said the engine supply is noticeably improving. Yet shortages of other parts mean the amount of unfinished work on the jets rolling out in Renton is still growing. Internal Boeing documents showing detailed operational data viewed by the Seattle Times indicate that on Aug. 30, Boeing Renton was roughly 26,600 jobs behind schedule. A week later, on Thursday Sept. 6, that total had swelled to about 31,000 jobs behind schedule. One worker said Boeing has set a daunting target of no more than 50 jobs behind schedule per airplane under assembly by the end of October, which would be a total of about 1,500 jobs. Those totals include final assembly, wings fabrication and pre-flight tests. Each job is one discrete task, each varying in complexity and the time and resources required for completion. A job like a pressure test of the finished aircraft will take several hours, and no other work on the plane is possible while it’s in progress. Smaller jobs, such as installing electronics modules, can be done faster and completed while mechanics do other jobs elsewhere on the airplane. Finishing work out on the field that is normally done inside the factory consumes far more time and resources, as equipment has to be brought out to the planes. Such out-of-sequence work, often referred to as “traveled work,” may easily take two or three times longer to do than if accomplished on the assembly line. In addition, all the parked planes have to be constantly shuffled around to be worked on, a time-consuming process. On a typical day last week 17 planes had to be moved from one spot on the Renton site to another, an internal Boeing document shows. Boeing executives told analysts Wednesday that to get a grip on the backlog of work they are adding about 600 employees to the 10,000-strong Renton workforce, with a combination of new hires and workers transferred from Everett and other Puget Sound facilities. Employees are working constant overtime. Many volunteered to work all through the Labor Day holiday weekend and a few have worked as many as nine weekends in a row without a break. “They have opened the checkbook, letting people work as many hours as they want,” said one Renton inspector. A high-grade factory mechanic, who like the inspector asked not to be identified because he spoke without management permission, said some employees are burned out, calling in sick just to get days off. 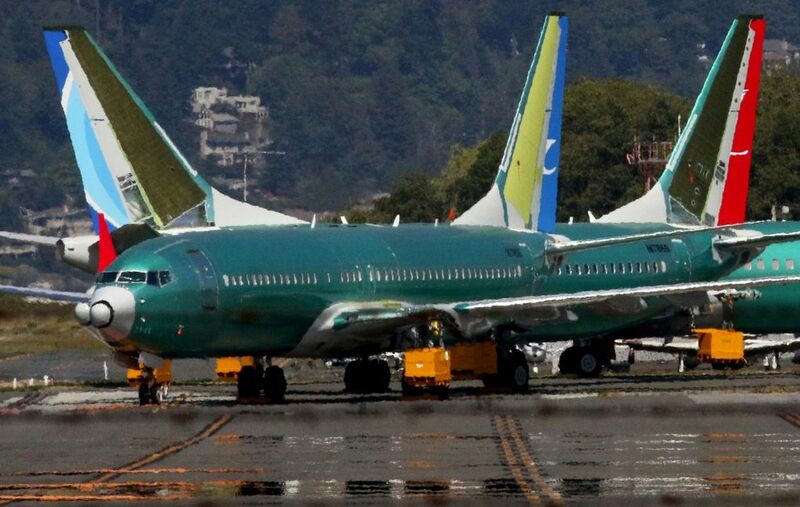 The Seattle Times report in early August that broke news of the extent of the 737 pile-up drew close scrutiny by financial analysts concerned about the potential financial impact for the rest of the year. At Boeing’s annual investor day in Seattle on Wednesday, executives tried to quell their worries, assuring the assembled analysts that the company expects the backlog of 737 jets to be cleared by year-end. Although Boeing delivered just 29 of the single-aisle 737s in July, down from 56 in June, and deliveries for the rest of the third quarter will be lower than initially projected, executives told the analysts that a rush of fourth-quarter deliveries will ensure Renton hits the expected number of jet deliveries for the year. Copeland noted that the LEAP engine delays are primarily due to the inability of metal suppliers Arconic and Precision Castparts to sufficiently ramp up production of castings and forgings as Boeing hiked its rate this year to 52 jets per month — a drag on supply that has been acknowledged by engine-maker CFM. “We’re still somewhat cautious that engines could present a problem for Boeing’s recovery plans,” Copeland wrote. And Ken Herbert, an analyst with Canaccord Genuity, was also circumspect in his investor note. “We put the odds at 50 percent that (Boeing) will succeed with its recovery plan by the end of 2018, with some suppliers indicating that the delays could spill into 2019,” Herbert wrote. Herbert said Boeing attributed almost all its troubles to the lagging supply of engines from CFM and fuselages from Spirit AeroSystems in Wichita, Kan. Philippe Petitcolin, CEO of French aircraft engine maker Safran, on Thursday said the CFM joint venture with GE would recover before year-end from delays on its LEAP engine shipments. Boeing executives said they’ve deployed a team of 82 Boeing employees to Kansas to help Spirit sort out its problems. But Herbert noted that recent delays affecting the 737 have included other airplane components, including the emergency oxygen supply systems above each passenger seat, produced by Rockwell Collins, and some composite panels on the 737 tail, supplied by the Xi’an Aircraft Company of China. Rockwell Collins declined to comment on any parts shortfall. The Renton inspector said a large delivery of oxygen generators came in this week. On the airfield in Renton this week, two 737s parked on the taxiway, one destined for Gulf airline FlyDubai and the other for Chinese carrier Shanghai Airlines, each had large panels missing from their vertical tailfins. “We appreciate the hard work of all our team members who are focused on … fully recovering the delivery schedule by the end of the year,” Bergman wrote. The Renton inspector said of the parked jets that it’s getting “harder and harder to get them flyable because of all the traveled jobs” and because of the influx of inexperienced workers brought in either as new hires or coming over from other jet programs. He said he’s seeing a lot of rejection tags on wiring modules. “We’re ripping apart some of the electronics racks already assembled to replace wire bundles that aren’t right,” he said. The high-grade mechanic said airplanes from the one of the three assembly lines, the one that builds only the new MAX version, are rolling out onto the field without power turned on. That’s a milestone in the build process that requires multiple checks, which are now often being performed by workers seconded from the Air Force tanker or 777 programs who are unfamiliar with the 737 systems. The inspector said his work group have asked their managers about perhaps stopping the production lines in order to catch up. That’s a drastic step Boeing took during a production meltdown in 1997, which led to billions of dollars in write-offs as well as high-level executive dismissals. Managers have responded categorically that a pause cannot happen because of the severe impact it would have on suppliers, on airline customers and on the company’s stock price. The mechanic said managers seem to be banking on doing a great deal of delivery catch-up by working full tilt through the Thanksgiving and Christmas breaks. He said managers are also contemplating rolling unfinished planes back inside the factory to perform an extra day’s work on the assembly line — using up a one-day buffer that’s added to the eight-day flow of work in assembling each plane. Meanwhile, even as unfinished jets pile up outside, the assembly line continues to flow at a build rate of 52 jets per month. Boeing executives insisted during the investor day that they remain on track to go up to 57 per month in mid-2019. As recently as the Farnborough Air Show in July, leaders at both Airbus and Boeing spoke of potentially taking their single-aisle airplane rates even higher, above 60 jets per month. In the current state of production, the Boeing Renton inspector is skeptical even of the plan to go to 57 next year. “Good luck with that,” he said.